One of my frequently voiced gripes about design is that fashion too often is allowed to override function. We get cars that look stunning, but have cramped interiors, or too little ground clearance, or silly little boots. 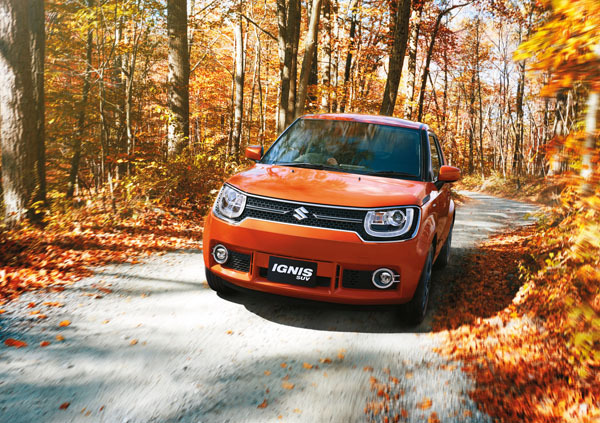 How a car as cute and fascinating in its style as the Suzuki Ignis can be both fashionable and functional brings a big smile to my face. Just look at that pert nose, fascinating tail with the stylised Suzuki badge in the C-pillars and interesting interior. Then jump inside one at your local Suzuki dealer and be amazed at the amount of space it provides. Suzuki is arguably the world leader in design and building of small cars and SUVs. That’s because it’s far more difficult to build a cheap car and still provide safety, comfort, economy and everything else today’s buyers demand. Sorry to have used the word cheap, with all the negative connotations it brings up, but this little Suzuki is astonishing value for money. The little Suzuki Ignis is a classic example of the Japanese giant’s engineering ability. It’s not really a small car, or a small SUV, rather a brilliant crossover between the two. The entry level GL manual comes to market at $15,990, the CVT $16,990, while the GLX, CVT only, tops out the range at $18,990. The latter was our test car. On-road costs need to be added to these prices. Ignis GLX has 16-inch alloy wheels, up from the GL’s 15s, automatic LED headlamps with integrated LED daytime running lights, keyless entry and push start, automatic air-conditioning and privacy rear glass. The opening pars say it all. We love the shape, and the customisation it cries out for. Colours, including two-tone combinations, give you plenty of chances to personalise. You can also customise the grille trim and centre garnish, choose wheel decals, side stripes and the C-pillar gill slits. Even the door mirrors and foglights can get their own personality. Great fun. 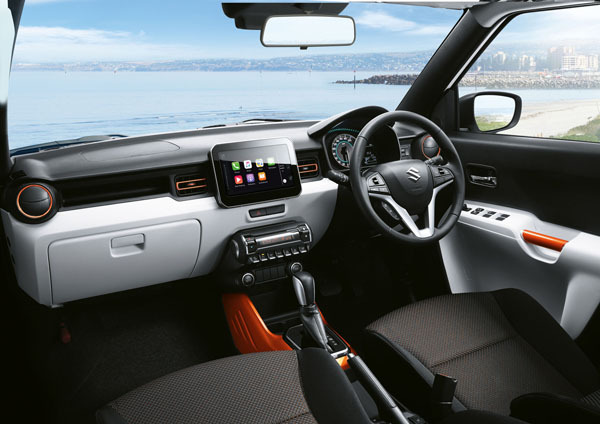 The Ignis’ cabin can also be personalised with the colour choices on the seat trim, centre console, transmission surrounds, grab handles on the doors, air vents. Interestingly the previous Ignis, which was last sold in Australia in 2005, had a fair bit of Australian engineering input. This time around, although our local guys and gals were part of the global team, most of the work was done by Japan. The Ignis as sold in Australia is powered by a new four-cylinder 1.2-litre Dualjet (two injectors per cylinder) engine. It puts out 60 kW of power at 6000 rpm and 120 Nm of torque at 4400 revs. It’s mated with either a five-speed manual or continuously variable transmission. Standard across the range are 7.0-inch infotainment touch screen for satellite navigation and rear-view camera, as well as access to audio, aux inputs, USB and SD card, Bluetooth and smartphone connection to Apple CarPlay, Android Auto and MirrorLink. The leather trimmed three-spoke steering wheel has audio and cruise control buttons, plus hands-free phone use. Safety is five-star with dual front, side and curtain airbags, electronic stability program, anti-lock brakes with electronic brake force distribution and brake assist. Somewhat illogically, CVT adds a hill holder. Manual gearboxes would benefit much more than the auto from a hill holder – then again those who chose a manual gearbox almost invariably take pride in their driving and have the skill to make hill starts. Head and legroom in all seats are impressive and the hip point height of the rear seat makes access and exit easy. Luggage space ranges from 264 litres with all seatbacks raised to 1104 litres with the rear seats folded. 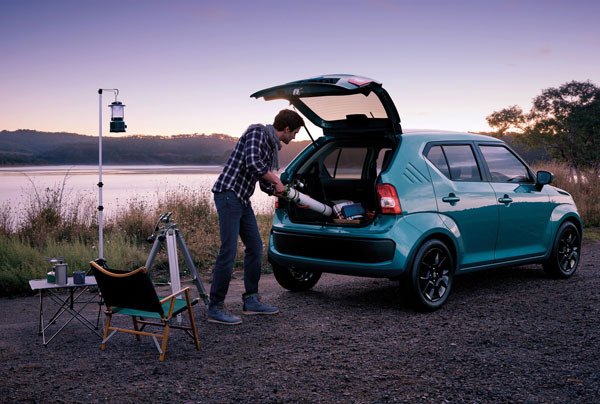 The squared off tail make loading easy, as does the higher than average height of the Ignis. While 60 kilowatts and 120 Newton metres aren’t what you would call big numbers the Ignis weighs in at just 820 kg so performs pretty well. The CVT can be irritating at time in the way it sounds, but there’s no denying its efficiency. Serious hills can tax the powertrain at times, but the little car manages to do its best. If you’re planning to carry four large adults, and that’s possible despite the Suzuki’s apparently diminutive dimensions, it might be an idea to get all four aboard and find a steep hill for your private pre-purchase road test. Comfort is pretty good on most roads and certainly on motorways. But rough roads can bounce things about at times. Noise levels are generally subdued – again, beware of rough ‘n ready roads. Handling is nimble and competent and there’s the sort of pleasure offered in small light cars that’s seldom there in large ones. Fuel consumption was often below five litres per hundred kilometres on easy-paced road, and we seldom saw more than seven litres per hundred even when we worked the little Suzy hard in boring suburban areas. Fashion and function in the one package – love it! And the most expensive Suzuki Ignis will be sitting in your garage with some change from $20,000 in your pocket. Well done Suzuki. Note: These prices do not include government or dealer delivery charges. Contact your local Suzuki dealer for driveaway prices. © 2013 Marque Automotive News- by Knights Design All Rights Reserved.